Fort Lee, NJ, August 3, 2017 / PRNewswire /-– Pioneer Power Solutions, Inc. (Nasdaq: PPSI) (“Pioneer” or the “Company”), a company engaged in the manufacture, sale and service of electrical transmission, distribution and on-site power generation equipment, today announced it is launching a comprehensive all-new line of power generation equipment designed for a broad spectrum of market segments, including but not limited to, prime power, standby power, agricultural, oil and gas, mobile, telecommunications and off-road applications. The line is expected to be marketed exclusively in eight states, and otherwise non-exclusively nationally, significantly expanding Pioneer’s addressable market for engine generators. Branded as “Pioneer Critical Power,” the complete line of engine generators, ranging from 9 kW to 2 MW of output per generator set, marks the Company’s initial foray into offering its own line of power generation equipment. The units are available for order now and first shipments are expected to begin in the third quarter of 2017. 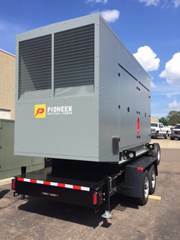 Pioneer has already booked over $1 million in new orders for these new private labeled generators, including one order for four 500 kW Tier 4-Final generators with custom enclosures and automatic transfer switches valued at $850,000, representing the largest single generator order in Pioneer’s history. current EPA standards to provide users an efficient and innovative power solution. 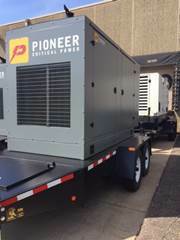 For more information on Pioneer Critical Power Generators, please contact Kwasi Twumasi at 952-512-2487.